In case you were wondering when President Obama was going to make good on his campaign promise to disarm Iran and prevent them from getting nuclear weapons, this story on how he has, in fact, teamed up with Iran and is now funneling them weapons should answer that for you. Turns out that in 2014, Iran is our military ally. Why is no one in the main stream media reporting on this? DEBKA: With the Geneva Nuclear Accord still far from implementation a month after it was signed in Geneva, the United States and Iran are moving into stage two of their rapprochement: They are now fighting together to crush Al Qaeda terror in Iraq, DEBKAfile’s exclusive military sources report. Iraq is two weeks into a major offensive for cutting al Qaeda down – the first major military challenge the jihadists have faced in the past six years. Three armies are fighting alongside Iraq: the United States, Iran’s Al Qods Brigades officers and Syria. 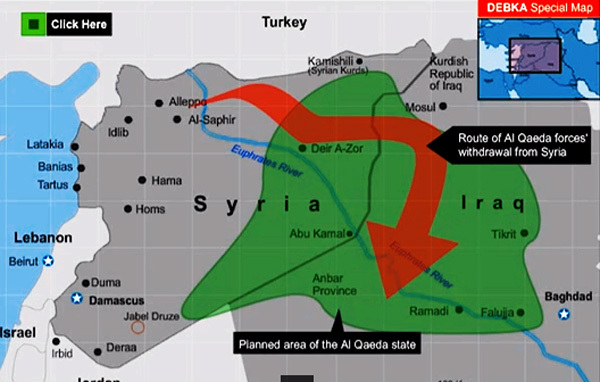 Their mission is to foil Al Qaeda’s drive to spread its first independent state in the Middle East across the Iraqi-Syrian frontier. Its Iraqi and Syrian branches – ISIS and the Nusra Front – have declared a holy war to this end under their commanders Abu Bakr Al-Baghdadi and Abu Mohammed al-Golani. The Anbar province of Western Iraq is the scene of he fiercest combat close to Iraq’s borders with Syria and Jordan. To counter Al Qaeda’s superiority in speed and surprise, the US has sent the Iraqi army Hellfire surface-to-air missiles. They are already in use against al Qaeda camps on the Syrian border. Next, Washington is sending out small, long-endurance unmanned aerial ScanEagles. These drones are best suited to combat in Anbar’s deep wadis and the halophyte thickets lining the Euphrates River.